When it comes to big brown eyes that beg for attention, Olivia, the Golden Retriever, has mastered the art. At a recent “graduation” party at Medical Center of Aurora she managed to get more hugs than anyone. Doctors thought she deserved to share in the goodies and the honoree was moved to tears as she hugged Olivia and said good-bye. It is hard to believe that five years ago Olivia was locked in an eight by ten foot cage with no dog house and only gravel to lie on. She was fed a poor quality dog food and probably anything that she could catch. For three years, since she was three months old, she had lived in that cage watching children play in the yard and the world pass her by. The owners of the yard in which she was imprisoned decided to re-landscape and part of the plan was to incorporate the cage area into the main yard. They planned to have her “killed” (their words) because no one wanted her. Fortunately, a pet loving landscaper that Sally (Olivia’s current “Mom”) knew was awarded the contract. For a month Sally and the landscaper went to the back of the yard to try to establish a relationship with Olivia. Olivia had never been socialized so aggression was the only response she knew to return the friendliness. As the time came near that the yard project was coming to an end, Sally knew it was time to follow her heart and take a chance to rescue Olivia from further abuse and eventual death. Under cover of darkness one night, a strategically planned covert operation freed Olivia from her inhumane confinement along with a promise that she would never again be mistreated. Her captors didn’t even notice she was missing, let alone want her back. Unfortunately Olivia did not think she had died and gone to Heaven. Taken from the only world she had known, she was frightened and confused with her new environment and life with Sally. With the exception of her savior Sally, she tried to bite anyone who came near. Years of malnutrition had taken its toll on Olivia’s stamina and the stress of her new life caused her to loose thirteen pounds in the first three weeks. Her hair fell out as well. Coming into the house for the first time was terrifying. Obviously her lack of socialization had taken a heavy toll. Showing her SUPERIOR intelligence Olivia very quickly learned the idea of potty training. Being in the yard without being confined to a small area was a long-time challenging adjustment. Running loose in the yard was a wonderful new freedom. For a year Olivia worked very hard on socialization and building trust. Her health returned and the once neglected blonde became a stunning red head. It was not an easy year. Patience was the password to a relationship and distraction was the only way to eliminate a faux pas. The problem was that she still wanted to run and she had no idea how to speak “dog.” Dog parks and visits with most other pets were too risky. She had already received a hole in her ear from a previous attack. Her house buddy, a ten year old German Shepherd, who she had learned to adapt to, had died. Sally’s work with the American Red Cross required travel and also provided a wonderful and very effective new training environment for Olivia. Olivia accompanied Sally to the mountains to socialize off leash with Search and Rescue dogs. She attended training classes and was a natural. The trainer of the Search and Rescue program tried to convince Sally to turn her over to him since she seemed so quick to learn (remember – SUPERIOR intelligence). Dog speak was easier off leash and she loved having a job to do. The bond between Sally and Olivia continued to grow and strengthen. Then Sally was called to New Jersey for three and a half months to work as a Mental Health officer for the Red Cross. This was a trip that Olivia could not accompany Sally on. The thought of having to leave Olivia behind was very tough and raised many questions in Sally’s mind. Would she do all right? Would she revert to aggression? Would she feel abandoned? Perhaps the most difficult question in Sally’s mind was, would Olivia still remember her after being apart for three and a half months? Sally’s cousin Jane Mather graciously agreed to keep Olivia who got along with her Search and Rescue blue heeler, Shockoe. Both times when Sally came back for a break she went to Fraser to be with Olivia. Needless to say Olivia had not forgotten her. It was very hard to leave again though. 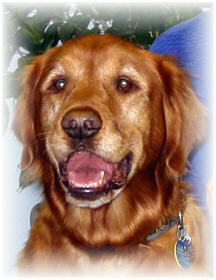 During her time in Fraser, Olivia continued to participate in Search and Rescue training and socialization. 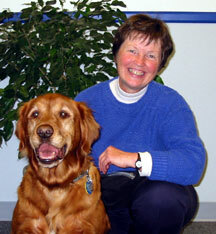 Jane continued applying gentle patience with Olivia and Olivia strengthened her bond with Shockoe. To this day, through weekly visits with one another, the dogs continue to nurture their friendship. Despite incredible successes, all was not perfect. Repeated ear infections began to take their toll and Sally became very concerned Olivia would get too far ahead of her in the mountains and would not be able to hear the call to return. At that point Sally realized that a new job needed to be found for her special dog. Because of Olivia’s intelligence, she thrived on constant stimulation and challenge. She had also mastered the fine art of “people loving.” This marked the beginning of Olivia’s accompaniment to various Red Cross meetings with Sally, particularly the evening meetings to offer protection. The truth of the matter is that she really went for all of the attention. A dream began to develop that Olivia could be a Registered Therapy Dog and Sally began the search for a program that would meet both the needs of Olivia and her. Sally envisioned them as a team that would be able to be of service to clients in the Red Cross. Delta Society was the organization of choice with no question. Delta’s standards were stringent which equaled the Red Cross’ desire for excellence. Also, the Delta Society’s was both professional and had a 26-year history of accomplished service in the field of animal-assisted therapy. Sally discussed Olivia’s future career as a therapy dog with Diana, Denver Area Pet Partners Coordinator, and there was no question. Delta was the right choice and Olivia began on a new journey to become a Pet Partner, Delta’s term for their registered therapy dogs. Olivia and Sally faithfully attended training classes toward the goal of obtaining the AKC Canine Good Citizen award and to improve her skills in interacting with other dogs. They did well even though Sally was panicked most of the time. She was so afraid Olivia would not do well and Olivia really NEEDED to work. Another natural disaster delayed the Delta Pet Partners training as Sally went off to a Red Cross assignment but the dream was not to be forgotten. Olivia’s compassion emerged as time went on but it was clearly evident on one particular occasion when two Dachshunds had run out onto Sixth Avenue. By the time Sally arrived on the scene, one dog had been hit and the other was obviously terrified. Needless to say, the owner was distraught. A call was made to a nearby vet who agreed to see the dogs immediately. Off everyone went. Olivia curled around the uninjured pup and the gentleman held his injured friend. It was pretty obvious the outcome would not be good and Olivia supported her new friend. When it was time to go home, she crawled in the car and just stared out the window. That evening she grieved for what she knew was a lost life. In 2002 Sally took the Delta Society Pet Partners handlers training from Diana, aided by a wonderful group of dedicated volunteers. Then, most of the class participated in six weeks of additional therapy dog training with their prospective Pet Partners. It was during this period of time that Olivia was diagnosed as deaf in the left ear. Hand signal training supplemented her therapy dog training and she continued. Finally the day came for testing, when Sally and Olivia were assessed for their skills and aptitude to do therapy work. Guess who was anxious??? Olivia passed with flying colors. 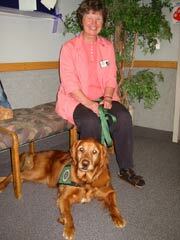 Soon Sally and Olivia began their volunteer work at Medical Center of Aurora North. The experience was unbelievable. The more she went the more she wanted to go. Her stamina for long hours had already been established so fatigue was not a problem (unless she is struggling with those pesky ear infections). The long-term intensive care unit was their first assignment and the various hospital equipment, strange smells and sounds and raised beds were no problem. As a mental health professional Sally was comfortable dealing with the fluctuating emotions. Olivia was held by Sally and stood on her back legs to allow even the most medically fragile patient to receive a visit. Her gentleness was amazing. As soon as her therapy dog vest came out at home, she was excited and ready to go. It wasn’t too long before Olivia had a cadre of admirers among the staff and patients. When the program expanded to the Senior Care Unit, where patients present with mental illness, specifically varying stages of dementia often as a result of Alzheimer’s disease, Olivia was ready. This was a job she showed unique aptitude for. She seemed to understand their confusion and adapted herself to meet them in their own reality, which was often far different from actual reality. She never approached without sensing it was okay. When patients came rushing up to her she remained calm. She knew she could rely on her partner Sally if she needed to be protected. At times, without warning patients would grab her roughly. She tolerated it with no sign of aggression, instead she looked up at Sally, seemingly asking, “Okay Mom, what now?” What a change from that frightened dog of years past! And how does she do with other dogs? Just ask Harriet the Basset Hound and fellow Pet Partner. At a recent luncheon at the hospital, Sally and Olivia came in the back door and Judy, Harriet’s handler, was up front with Harriet. Everyone chuckled in amusement as the dogs greeted each other from opposite ends of a large room. Harriet bayed in response to Olivia’s bark. Once initial greetings were done, both dogs settled. 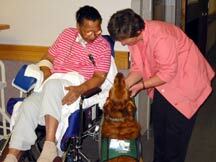 Attending hospital luncheons isn’t the only way appreciation is shown for the work the dogs do with the patients. One of the benefits of being a therapy dog is that the hospital staff always have a little treat. 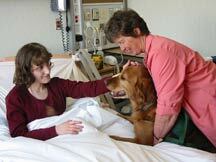 With gentleness that is astounding Olivia takes a treat from anyone, staff and patients alike. She does not ask Sally’s permission. But then – the important thing is that she be happy. Just ask Sally. Olivia goes just about everywhere with Sally. They recently taught a Red Cross course up in Casper, WY for two days – eleven hours each day with two days of travel. Olivia has been a co-instructor in classes all over the area and has mastered the art of working the room. She readily identifies the most needy person in the room and dispenses comfort by lying down by them. In early April, Denver was blessed with nearly three feet of snow and Sally was called to Denver International Airport to meet the emergency needs of stranded passengers. It was only natural for Olivia to go along and the airport officials agreed. For three days they lived in the airport with the passengers. Sleep was gotten only in snatches. At one point a young soldier on his way overseas came looking for something to eat. He was too anxious to sleep and had been awake for two nights. Since he seemed so totally enthralled with Olivia, Sally suggested he lie down (on the floor as that was all that was available) with Olivia. In five minutes both were snoring. Fortunately, he was told before long when his flight was departing and the two of them slept soundly until Sally woke them for breakfast and the soldier’s departure. Another incident of Olivia’s wonderful ability to turn a negative into a positive occurred with a little girl who had endured mouth surgery before being stranded at the airport. She was understandably cranky from hunger, fatigue and the pain in her mouth. While Sally got the paramedics to deal with the pain and Pour Le France prepared scrambled eggs (this was in the middle of the night), Olivia provided the needed comfort. When the little girl’s tummy was full and the pain was abated the two of them settled down to a cozy, satisfying nap. Olivia worked for three days and nights at the airport. She was tired when she got home and slept for 12 hours but she did her job and did it well. Olivia now lives the life of a truly treasured friend and has recently acquired a new friend of her own. Sally had told her they were going to get a female Golden Retriever someday and would name her Fiona. Well, that has not happened yet. However, Olivia helped with a rescue after the May snow storm and now has Pauline to torment her. A patio roof collapsed on a litter of kittens who were not yet weaned. After four days the owners of the house called for help because of the crying they could hear. Sally was called in with Olivia to check it out. Under the debris Olivia excitedly sniffed and Sally was guarded as Olivia had not met a cat before – well, at least not one that she didn’t try to chase. Amongst the rubble lay a sickly feral kitten, the only survivor from the ugly collapse that had killed her mother and siblings. Sally felt compelled to take the kitten home herself. Olivia sat with her in the car all the way home and seemed just curious. Then, the unthinkable happened. Pauline had recovered and was missing. Sally suggested Olivia “Go Find” the kitty and soon Olivia returned, gently carrying the kitten in her mouth by its head. Even though several people had come forward to adopt the kitten, she had already found a new owner and friend. Olivia had claimed her as her own. What started as a life of terrible neglect and abuse, has now become a living miracle of the incredible capacity for forgiveness and love that exists in a dog. This miracle is Olivia. Olivia has come a long way. The painful memories of being unloved have not succeeded in destroying her capacity for sharing her own unconditional love. So that no one else will feel the pain of being unloved, Olivia doles out her special brand of love to everyone she meets. If only we could love so unconditionally, without prejudice and selfishness, and perhaps most admirably, without expecting anything in return. Thank you, Olivia, for enduring all that you have, for being all that you are, and for all you are yet to become. Sally, you are to be commended for your compassion in not turning your back on an animal in need, for your foresight in realizing the incredible potential in Olivia and your perseverance and commitment to an arduous and lengthy training period to polish this "diamond in the rough". You and Olivia embrace the will and determination it takes to excel in animal-assisted therapy and truly make a difference in every life you touch. It's an honor to work alongside you on the Denver Pet Partners team and Delta Society is proud to have Olivia wearing her green Delta therapy dog vest .